The perfect PC: Quiet, but powerful. Roomy enough to hold your expansive DVD collection, but small enough to tuck inside a cabinet. It should look nice and be ready to tackle all of the latest and greatest games, but it shouldn't break the bank. The perfect PC means different things to different people. If you search hard enough, you may find a factory-made ma­­chine that matches your ideal, at a reasonable price. But if you'd rather not wait for a major retailer to hit all the right notes, consider building your own system. Don't worry--putting together a PC is a lot easier than you might think. And there are plenty of good reasons to do it. If you've ever had to ship your computer back to the manufacturer for a checkup, the experience may have encouraged you to think seriously about rolling up your sleeves and doing your own troubleshooting. Lengthy turnaround times, or hours spent sitting on hold with customer service are maddening enough. But if your machine happens to be out of warranty--or didn't have a very good warranty to begin with--the cost of getting a part or the entire system replaced could be more than you bargained for. Most of all, building your own system is fun. Technology has be­­come increasingly complex, but PCs are modular--and with our step-by-step guide you can put together a dream machine that's just right for your needs and budget. Note: The do-it-yourself process is a double-edged sword. Whether you've had positive customer service experiences in the past or not, having a single seller to turn to if your equipment goes haywire can simplify troubleshooting (and replacing parts). Getting a faulty component replaced on a home-built machine entails working with individual product manufacturers, which may increase the overall hassle. But to help those who've never built a PC before, or just need to brush up on their technique, we've created a three-part video series that walks you through the process. Caveats aside, you'll be hard pressed to find a computer that suits your needs better than one you build yourself. The first and most important step in building a PC is to know exactly what you want it to do. The only thing worse than wasting time assembling a subpar system is spending far more money than you need to, cobbling together a quad-core behemoth that you'll be using just to check your e-mail. Once you have identified the functions that you want your PC to perform, decide how much you're willing to spend. A system designed for gaming or video editing will require a larger investment than one intended for nothing more demanding than surfing the Web. Our parts lists enumerate the components that we chose, and explain our rationale--beyond sticking to our budget--for choosing each part. For our tests of our DIY system, we used the PCWorld Labs' WorldBench 6 benchmark suite. WorldBench 6 gauges real-world system performance on a series of tests based on common applications. We calculate WorldBench 6 scores by timing how long a machine takes to complete the various tasks, and weighing those numbers against the performance of a baseline system. We also conducted a gaming test, using Unreal Tournament 3 to provide us with a graphical performance benchmark. With test results in hand, we compared the data for the PC that we built from scratch against the average for machines at similar price levels. All of the competitors we considered were re­­cently reviewed machines, available at retail. 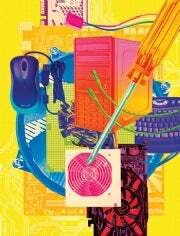 On a $500 budget, PC manufacturers have a clear advantage: By ordering in bulk and maintaining direct control over their supply chain, they can buy components at lower prices than can an individual user shopping for parts online. On the other hand, they have to pay for assembly (do-it-yourselfers work for free) and of course they have to build in a profit margin. Test report: The results for our home-built $500 PC versus the average results for all store-bought $500 PCs. Overall, our results weren't bad. On our WorldBench 6 tests, our $500 system scored 3.7 percent below the average mark for budget desktop PCs in the same price category. Graphics performance was better--though not exceptionally so. We couldn't eke out a playable frame rate, regardless of setting, which is normal with integrated graphics. Despite such results, our $500 PC still outperformed the category average in gaming frame rates by a considerable amount. Limitations in gaming performance aside, our $500 ma­­chine does excel at tackling high-definition content. Our motherboard's integrated graphics chip offers MPEG-2 and H.264 decoding, which helps lighten the load on the CPU. The end result is smooth, stutter-free playback, even at higher resolutions. You'll also have enough power to run multiple displays--an arrangement that's handy for getting work done when you aren't watching your favorite flicks. Despite its marginally lower performance, our $500 ma­­chine has a few advantages over competing prefab systems. Machines in the budget desktop PC category generally get tucked into petite, custom cases that don't offer much room to grow. Our Rosewill chassis isn't much larger than the average, but it can accommodate various components that you may want to introduce later on. Likewise, our motherboard's integrated graphics system leaves PCI slots available for adding a discrete graphics card, if we'd eventually like to make our rig a bit friendlier for gaming or video editing. Though our $500 machine struggled a bit to keep up with its low-cost preassembled peers, its $1200 sibling had no such trouble. The higher price ceiling allowed us to focus on getting stronger performance, while building a machine that was quiet, user friendly, and reasonably attractive. Test report: The results for our home-built $1200 PC versus the average results for all store-bought $1200 PCs. 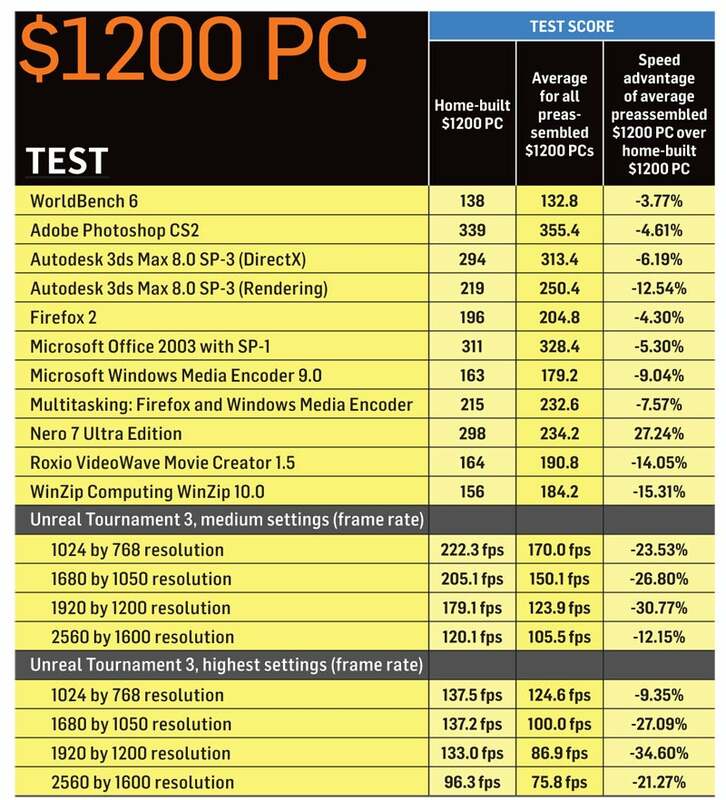 Our $1200 machine's WorldBench 6 performance was almost 4 percent better than the average for the mainstream desktop PCs category. That's a marginal bump, but bear in mind that the Core i7-875K processor we used is unlocked and thus overclocker-friendly. If you're feeling a little ad­­venturous, you can easily push the CPU beyond its stock clock speeds and get a little more mileage out of your system. You can ob­­tain even more legroom by upgrading from the inexpensive CPU cooler we selected to something a bit larger. Even if you'd rather not dabble with overclocking, you won't find it easy to beat our performance results at this price. Graphics performance was also noteworthy, which will please builders looking to play some games on their rig. 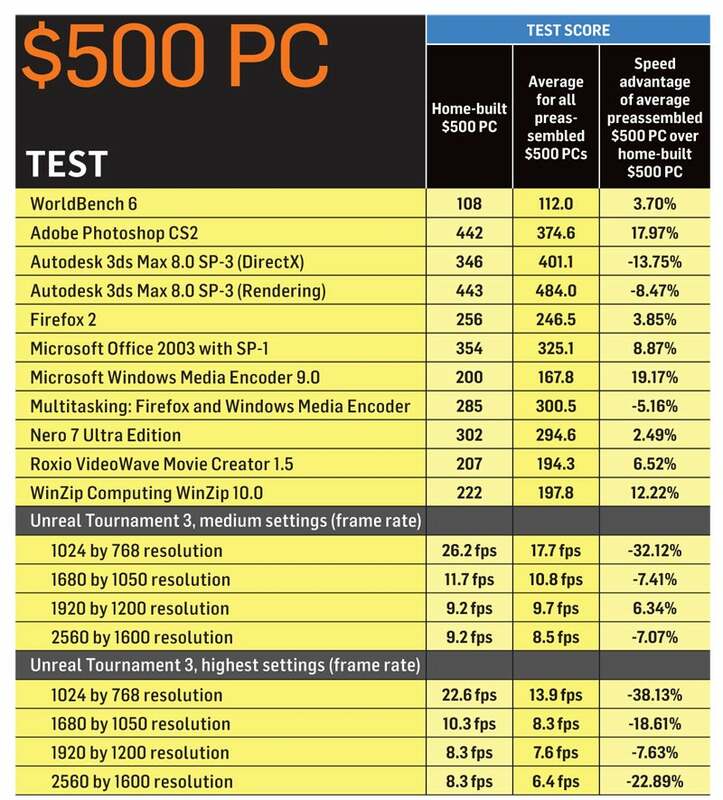 Our $1200 PC's XFX Radeon HD 5850 trumped the mainstream PC category average in our gaming tests, across the board. As with our budget model, taking the do-it-yourself route enabled us to choose a fairly versatile case. The Zalman Z7 chassis has plenty of bays for future expansion, while muffling much of the racket that the components make.